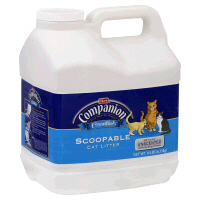 In my opinion Companion Essentials is the best clumping clay cat litter. Pretty low dust, very nice price. I've tried all types and can sympathize with cat owners looking for the best clumping litter. A big plus is it comes in "unscented", but I find even the "scented" is very low scent (you can test this out in the store simply by unscrewing the jug). A 14lb jug is usually around $4.99. A 21lb jug is usually $6.99. Sometimes it will go on sale. The other day for example I got the 21lb jug for $4.99!! I usually prefer the smaller jug since it is easier to pour, but what a deal-and I can pour it into the smaller jug for easier pouring. Forget about the boxes- I couldn't stand fumbling around with pouring from an awkward box and then trying to reseal it, heck you can even reuse the jug if you want! I have two cats and they each have their own boxes and are finicky and they have no problem even with the "scented" version. This also comes in the "Crystal Blend" Formula, but I've not tried that one. The only drawback is I've only found this brand at Stop & Shop supermarkets. Companion Essentials Crystal Blends is a premium clumping clay cat litter with odor absorbing crystals that is fragrance free and of great value. Kitty's litter box is in a small bathroom and still no problems with odor. I prefer to scoop twice a day which also helps. The clay grains are small, soft and dust free. My kitten loves it and so do I!!! I highly recommend this product. Do not judge it by its cover. So far, it is only found at Shop & Stop. I used to use Tidy Cat (for about twice the price for equal quality)the discovered Companion Essentials. Gimli, 13 years old today, didn't even blink at the change. He also thinks the catnip is pretty cool. "Giant" grocery stores carry the Companion cat litter. My favorite is the crystal blend--love the product--I'm in the mid-Atlantic area.